The Friends would like to continue to refine and update this over time so if you have suggestions for places to include on this map or notice any necessary corrections then please let us know! Thursday volunteers continue into 2018! woodland thinning at Abbey Hey. clearing an area of brambles near Nelstrop Road North, to create a wildflower area. installing the wildlife posts at several Loop entrances. 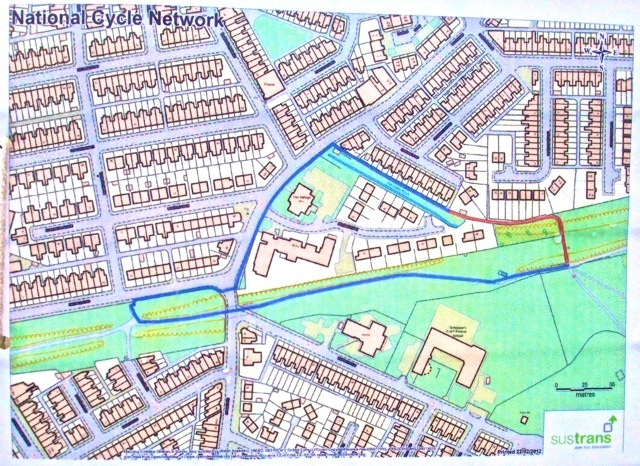 multiple activities at the Levenshulme quadrants (digging out rubble, removing the remaining stumps of small trees, pruning the large hawthorn and cutting back the surrounding undergrowth – all with a view to having a larger open grassy area that can be kept mown short, and so provide a more useful area for community activities). For the first outing of 2018, the group was out this past Thursday clearing the already-cut brash that was lying around the Athol Road entrance and consolidating it into habitat piles. As well as making the entrance more attractive, this will give the bulbs planted a year ago a better chance to see the light. For more information about these task days, which run from 10 a.m. to 1.30 p.m., please contact us, then Sustrans or those co-ordinating the Thursday events will get back in touch! We have received this flyer from the Friends of Highfield Country Park for the opening of a new feature at the park, which is just off the Loop in Levenshulme! The event is this Sunday (7th July 2013) from 2 to 4 p.m. – all are welcome! On Sunday 20th May the Friends will hold an opening ceremony for the new Levenshulme station community orchard and the refurbished Highfield Park ‘lattice footbridge’, starting at 11 a.m.
11 a.m. at the orchard site (Crayfield Road/Kersh Avenue Loop entrance): opening remarks by Friends Secretary David Beetham, ceremonial tape-cutting by local residents and photo session. 11.30 a.m. (approximately) at the lattice bridge site: some reminiscences from Friends member (and Friends of Highfield Park chair) Alec Cowan, tape-cutting by him and St Andrew’s school representatives and photo session. The fruit orchard, comprising apple, cherry, plum, greengage and pear trees, has been made possible using funds from the Friends, including a Manchester City Council environment award, with matched funding from the Government’s Big Tree Plant initiative, and sponsorship by local people. Sustainable transport charity Sustrans, which owns the Fallowfield Loop, provided equipment and manpower for ground preparation, including Community Payback personnel. The Friends, several local Levenshulme groups and individuals were involved in the actual planting, with help from the Sale and Altrincham Conservation Volunteers. The orchard project also involved two fruit tree grafting workshops, led by members of the Friends. The grafts are currently being ‘fostered’ by local people until they are large enough to add to the orchard. The ‘lattice bridge’ is almost the only remaining railway artefact on the Loop. The footbridge connects the north-west corner of Highfield Country Park with Thorncliffe Grove and is well used by recreational walkers and schoolchildren. The refurbishment work involved replacing the top surface and several corroded metal plates supporting it, repointing the brickwork, replacing coping stones and repainting the metal latticework in the colours of the railway company that built the line. The Manchester office of Sustrans sourced a grant for this work from the Department for Transport’s Links to Schools programme and organised the refurbishment, which has been a long-standing aim of the Friends. Renovation of the Lattice Bridge gets started! Work on the renovation of the historic lattice bridge, which crosses the Fallowfield Loop and provides access to Highfield Country Park, is getting started. 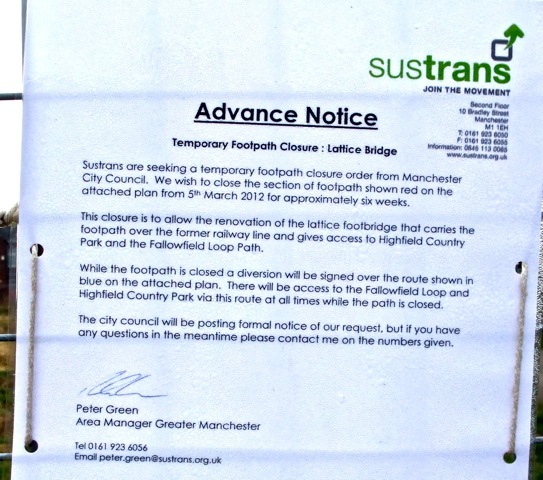 The footpath over the bridge will need to be closed for the duration of the work, but there will continue to be access to Highfield Country Park and the Fallowfield Loop via an alternative route.